There are a lot of niche dating sites out there, but only a few that are focused exclusively on smokers. Smoking Personals is one of the few sites that has smokers looking to meet other smokers. If you love to light up, and you are looking for someone cute to share a smoke break with, click through to see if this is the site for you. OMG! There is no where left to smoke, except in a small closet in my house...when I'm sure no one else is home, and no one is coming over!!!! If you feel like that sometimes, then you might enjoy Smokers Personals, a site for fellow smokers who would like to take a break from criticism, and meet up with other smokers online. As part of one of the largest networks of online dating sites, Smoking-Personals allows members to connect with other smokers online. Joining is free, and while all the options of the site are not available to free members, most of them are. If you light up at least a couple times a week, you should join for free to see if this is the site for you. 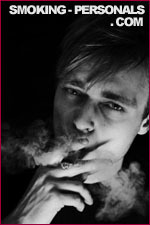 Smoking Passions is a 100% FREE dating & social networking site for smokers looking to meet other smokers. Join for free and take advantage of free email, chat, forums and more. The first step to making a new friend or starting a romance is to meet. While that goes without saying, there are different ways to meet, even online. Smoker Chat City is designed to connect smokers around their shared interest in smoking, and what comes of that is up to each individual. Join for free to see if Smoker Chat City is the site for you. Cigar Passions is a 100% FREE dating & social networking site for cigar smokers looking to meet other 'cigar aficionados'. Join for free and take advantage of free email, chat, forums and more. 420 Singles - Why toke alone?